80 years, 2 months, 18 days old age. 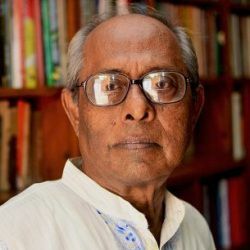 Hasan Azizul Huq will turn 81 on 02 February, 2020. Only 9 months, 12 days, 4 hours, 0 minutes has left for his next birthday. Hasan Azizul Huq has celebrated the total number of 80 birthdays till date. See the analysis by days count and bar graph. Hasan Azizul Huq, an eminent litterateur, was born on February 2, 1939, in Jabgraam, District Burdwan of British India which is now part of West Bengal of Independent India. He is an Indian Writer, Author, Novelist & Professor who is famous as a short story writer. He was also a philosophy professor at the Rajshahi University. Hasan Azizul Haq has done a lot of experiments with Bengali language and incorporated these experiments in his short stories for example by way of introducing modern idioms in his writings. His writings have also been translated into languages like English, Hindi, Russian, Urdu. His First compilation Samudrer Swapna, Shiter Aranya was published in 1964 and other considerable volumes are Atmaja o Ekti Karabi Gaachh in 1967, Jeeban Chase Agun in 1973, Naamheen, Gotraheen (1975), Pataale, Haaspaataale (1981), Ma Meyer Sansar, Aprakasher Bhaar (1988), Raarbanger Galpa (1999). He has bagged the majority of literary awards and includes the Bangla Academy Award in 1970, Ananda Purashkar in 2008.